Create the cook space you’ve always wanted. We design, help with selections and sell four cabinet lines to suit your needs. Need more room? Trust our room addition experts to match a new space with your home’s current look. Expand your living space now. Whether you want a whole new master bathroom remodel or just an update, we can help. Tell us your ideas and we’ll make it happen. Cleveland and surrounding Northeast Ohio’s leading construction and home improvement company! Specializing in kitchens, bathrooms, bedrooms, basements and more, our award-winning design, building, remodeling and general contractor services will make your home look and feel great. We work with homeowners every step of the way, analyzing project viability, setting a budget and creating an accurate timeline. Correct measurements and 3D design ensure a good outcome—and our expert team of plumbers electricians, carpenters, designers and installers work in concert, treating your home like their own. Tamer Construction has been a Cleveland home remodeling company since 1988. Since then, our Houzz award-winning Ohio-area home design and renovation firm has earned numerous accolades and stellar customer reviews. Better Business Bureau-certified, and a proud member of both the National Association of the Remodeling Industry and the National Kitchen & Bath Association, Tamer Construction is your trusted choice. Transform your house into a home—on-budget, on time, and to your satisfaction. From sleek, modern kitchens and bathrooms, to functional basements, attractive in-law suites, value-enhancing home additions and ADA-certified remodeling, Tamer Construction helps bring your home renovation dreams to life. 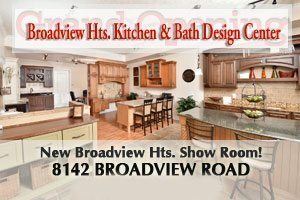 Two showrooms in Broadview Heights and Parma highlight our standard of excellence. Come on by and see for yourself! — Brian & Carmela F.
PHOTO GALLERIES: Get Home Remodeling Ideas! Serving all Northeast Ohio suburbs including Parma, Independence, Broadview Heights, Brecksville, Richfiled, Bath, Strongsville, Brunswick, Fairview Park, Westlake, Rocky River, North Olmsted, Shaker Heights, Beachwood, Moreland Hills, Hudson, Solon, Twinsburg, Mayfield, Oakwood, Akron, and the city of Cleveland. Our process begins with knowing you and your ideas. Complete and submit our QUESTIONNAIRE. We will get back to you shortly with an estimated budget and answers to any questions you have about your home remodel.